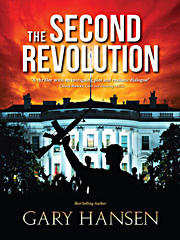 The Second Revolution is a fun and action-packed read with some very likable characters. The main protagonists, a crime victim named Jake, his “sudden” girlfriend Monica and her preacher father, Clive, are fully developed and human. Nothing cardboard about them. They get caught up in the events of the day and react as many would. The current President of the United States, a politician named Singleton, is trying to pass a draconian tax overhaul. Two congressional opponents are assassinated. Then, a reporter is murdered. All fingers point to President Singleton who — using the killings as an excuse — orders the confiscation of all handguns in the country. I don’t give spoilers in my reviews but you can bet that half-the-country doesn’t like it one bit. The book raises the question of what are the moral limits to protest, to civil disobedience, and finally, to open revolt? To his credit, the author does not pit one political party against another. In fact, no political labels are ever used in The Second Revolution, nor are ideological ones. Instead, there is simply a corrupt president violating the Constitution, and what are the American people going to do about it? Gary Hansen’s The Second Revolution will keep you going. It IS fantasy, since I wonder if Americans have grown too complacent to even fight for their rights. When England and Australia confiscated its citizens’ firearms, there was nary a whimper. I would hope, should this tale come true, that it will be different here.